Happy New Year from Cooking Matters! We're so appreciative of all you contribute to Cooking Matters! Thank you for all you do for our program and our community!! This month, we're looking back at 2017. We take a look at survey data, and a very powerful story about the impact Cooking Matters had on the health of one Participant! We could't do it without you!! 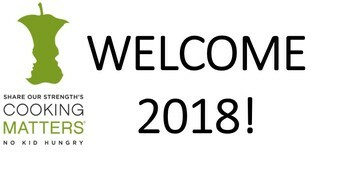 Cooking Matters is looking forward to seeing you in the 2018! 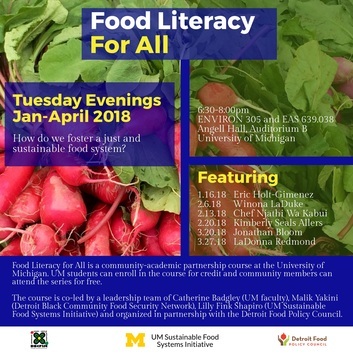 The Detroit Food Policy Council and the University of Detroit Campus Kitchen have teamed up to offer the first in a Film and Dialogue Series about food-related issues. Filmmakers and food lovers Jen and Grant dive into the issue of food waste from farm, through retail, and decide to quit grocery shopping and survive only on discarded food for 6 months. 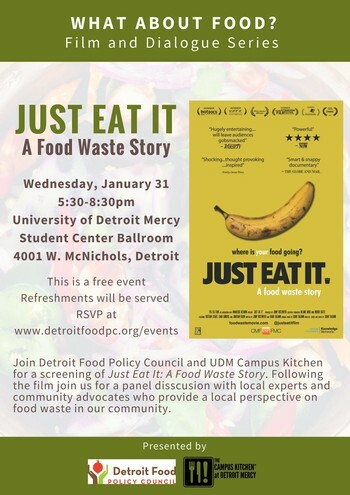 Following the film, enjoy a panel discussion with local experts and community advocates who provide a local perspective on food waste. Among the panelists will be Cooking Matters Volunteer, Kevin Kay! Please RSVP here. To view a University of Detroit Mercy campus map, click here. There will be signage to direct you to the Student Center, and event. The ballroom is on the second floor of the Student Center. There is security at the campus gate. Please ask the public safety officer for more directions regarding parking. Contact Carolyn Sagi with questions regarding event details, csagi@gcfb.org, 313-580-9822. Each Cooking Matters course begins and ends with participant surveys. Have you ever wondered what we do with all that data? The primary question the surveys answer is "Does it work?" We want to see how Cooking Matters impacts participants' real-life shopping, cooking, and eating habits. 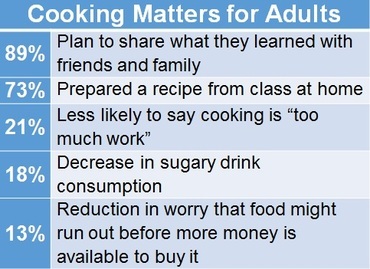 Participants in Cooking Matters for Adults reported substantially more interest in cooking at home, increased food security, and decreased consumption of sugary drinks. Even better, 89% planned to share what they learned with friends and family. Fewer French fries and more fruit? 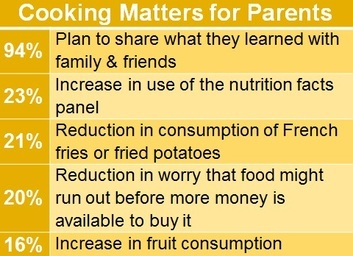 We're particularly encouraged by the healthy changes in our Cooking Matters for Parents courses. Plus, with more stability in their food budgets, these parents are helping make "No Kid Hungry" a reality. Our families classes aim to get kids and parents cooking healthy foods at home - and we saw 100% move in that direction! 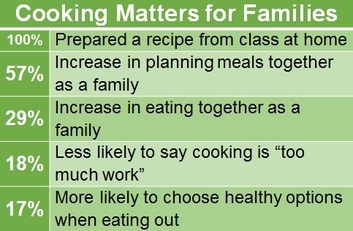 Cooking Matters for Families participants were substantially more likely to plan, prepare, and eat healthy meals together after the course. 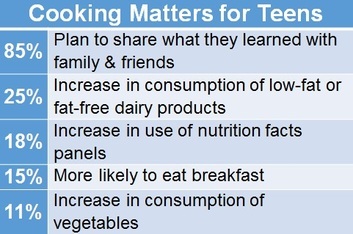 After Cooking Matters, teens made savvier choices using the nutrition facts panel, ate more vegetables and low-fat dairy, and were more likely to eat breakfast. Establishing healthy habits at this age is vital, so we were especially happy to see that most teen participants planned to share their knowledge with friends and family. Even one session of Cooking Matters programming can make a big difference! Cooking Matters at the Store tour participants were eager to practice label-reading and price comparison skills on their next shopping trip. It's always fantastic to hear participants talk about the positive changes they're making, and it's even more exciting to have the data to back it up. John knew he needed to make changes. His weight was up. With it came struggles with diabetes and high blood pressure. His doctors prescribed medications to address the issues, but John knew he needed to do more. John learned that a course would be offered at the apartment complex where he lived. It was called Cooking Matters for Adults. It advertised nutrition and culinary education, teaching participants to stretch food dollars in the most nutritious way possible. John was interested, and signed up for the class. For six weeks, he worked with a culinary instructor, nutrition instructor, and a class of motivated friends. He learned about MyPlate. He learned to eat a variety of fresh, frozen and canned fruits and vegetables every day. He learned about whole grains, and different types of fat. He learned delicious alternatives to sugary beverages. He learned to identify and choose lean protein and dairy foods. He also learned basic culinary skills and delicious recipes. John found his experience very informative and motivating. He was engaged, and ready for a healthy transformation. At the end of his course, John thanked his coordinator. He told her what a big difference the course had made for him. They snapped a picture together. As the weeks and months went by after his Cooking Matters for Adults class, John realized he had the basic building blocks to make the changes that would be beneficial to his health. He tried to follow the instruction from class. He ate according to MyPlate. He cooked healthy, delicious meals that fit his budget. John got more active. The weight began to come off. The healthy changes also began to show in his labs and the way that he felt. "I feel better now than I did when I was 21." A few years after the class, John is now 70 pounds lighter. He feels great, and he's very proud to say that he is off ALL of his medications, and his pharmacy bill is ZERO! John credits the experience he had with Cooking Matters for the motivation and the building blocks that set him up for success. To John, and to so many others, Cooking Matters! Watch at home, or with other interested community members. Winona LaDuke will be livestreamed at American Indian Health and Family Services. Fernando Funes Monzote and LaDonna Redmond will be livestreamed at the University of Michigan Detroit Center. 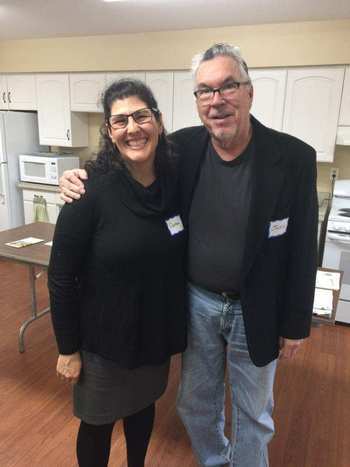 Kim Fronrath and John Wolford began volunteering with Cooking Matters together in 2016. Married and retired, they share their time and enthusiasm as Classroom Assistants. Collectively, they are this month's Volunteer Spotlight. I (Kim) retired from the Pharmaceutical Industry 3 years ago. I enjoy volunteering, taking classes, playing golf, traveling, hiking, biking, gardening and all things active. I have always enjoyed cooking and in recent years taken more interest in food sourcing and artisan preparation. During my employment, I worked with Oncology and Diabetic patients where nutrition plays a very integral role in healing and treatment. John retired from Ford Motor in 2015. He is active in his church, plays a lot of golf, gardens, cooks, hikes, bikes and plays with the grandkids. I found the Cooking Matters program through volunteer.org when I was looking for opportunities to contribute to the community. John asked to join in the volunteering because the mission of Cooking Matters, aligns with what we try to incorporate with our lives. 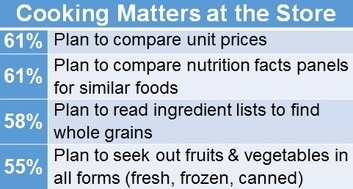 We try to cook well and simply with nutrition, budget and sourcing in mind. My favorite part of the program is what I learn from the students. Many of them are so knowledgeable and just trying to renew and add to their own skills. I like the enthusiasm from the groups!! John really likes the interaction with the people and organizing the food for the students to take home. I can't think of a favorite moment. There were many memorable experiences in the class I worked in with Disabled adults, but nothing that particularly stood out. We always have pasta, beans, sundried tomatoes, olives, good oils and vinegars, all kinds of nuts and seeds, yogurt, fruit and vegetables. Probably, the favorite activity of my spare time is travel and reading. I like to expand my perspective on other cultures and our place in the world. Travel expands my thinking and I learn the relevance of history. I also love the art, architecture and sculpture of the world. Reading does all of the same things and is something accessible all of the time. John's favorite spare time activity is GOLF!! He also loves MSU football and has had season tickets since 1982. Cook a cup of barley or farro and drain. In a saute pan, cook 1 small chopped onion in 2 T olive oil untill soft. Add 8 oz of sliced mushrooms and cook until soft. Season with salt and pepper and garlic to taste. Add 12 oz washed, trimmed and chopped Kale to the vegetables and cook until it wilts. Add 1 cup whole cherry or grape tomatoes, and the cooked and drained barley or farro. Season again and toss together to heat. Cooking Matters Volunteer, Jane Kersjes was recently honored as one of the Association for Fundraising Professionals' Distinguished Volunteers. A retiree from DTE Energy, Jane has been volunteering with Cooking Matters since 2016. Cooking Matters is lucky to have her time, as she is active with many organizations, including AARP, Red Cross, and Mercy Education Project. Click here to learn more about the accomplishments of this fantastic volunteer. 3:05 p.m. - 5:05 p.m.